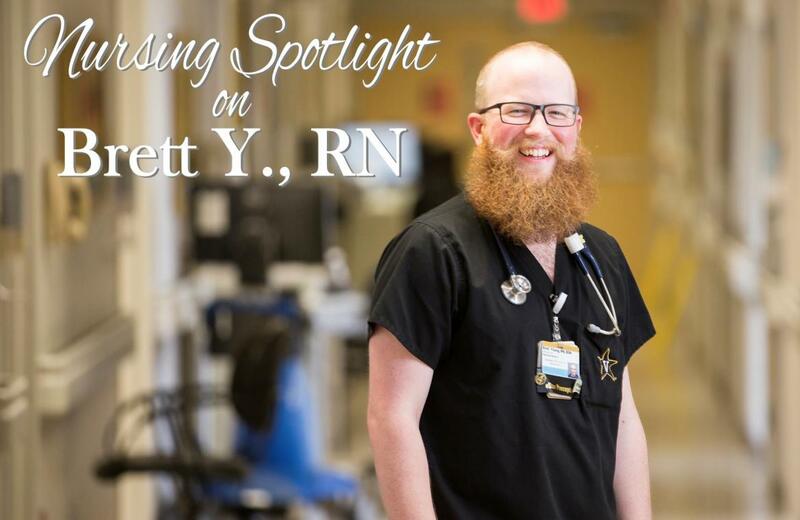 Brett began his nursing career at Vanderbilt University Medical Center in the Summer 2012 Nurse Residency Program and is now a Clinical Staff Leader on the Acute Care of the Elderly (ACE) unit. He is passionate about Shared Governance and continuing his education to further his nursing career. What has been your career path? Where are you now on your path? I started the Nurse Residency Program in the summer of 2012 on the Acute Care of the Elderly Unit where I served as Unit Board Chair for two years. During that time I transitioned into the RSL (Relief Staff Leader) role and joined various committees. I started attending Nursing Staff Council meetings and it changed my outlook on everything! I took on a few projects and advanced the career ladder to RN 4 through Vanderbilt Professional Nursing Practice Program (VPNPP). I'm now in my third year as Co-Chair of the Vanderbilt University Hospital Nursing Staff Council and I've become more interested in nursing leadership. I currently serve as the 7RW/ACE Unit Clinical Staff Leader and hope to enroll in a MSN Nursing Administration program next year. How did Vanderbilt University Medical Center's Nurse Residency Program support your transition to practice? What has the experience meant to you? The Nurse Residency Program put me a step ahead and allowed me to see the big picture. I'm grateful for the time spent learning about shared governance, our Professional Practice Model, and the culture surrounding evidence-based practice. The residency gave me the tools to kick start my career and fostered the drive to continually improve the nursing practice. Did you consider other residency programs? Why did you choose Vanderbilt? Growing up in Nashville, it's hard to ignore Vanderbilt's reputation. The opportunities for professional development made it an easy choice. There are so many different career paths to take in nursing, and Vanderbilt offers everything. You can spend an entire career at the same organization. What is it about being a Vanderbilt nurse that makes you proud? I'm most proud of our Shared Governance structure. Nurses run the show! Staff nurses have a direct link to the CNO, and we truly make a difference every day. Being at the forefront of healthcare innovation and advancement of nursing practice makes it a truly exciting time to be a Vanderbilt nurse!